"In order to find the progenitor of the House lines who live in or have descended from the Mohawk Valley families, we must go back to the period of 1708-1709. Among the Palatine refugees who came from England to America with the Rev. 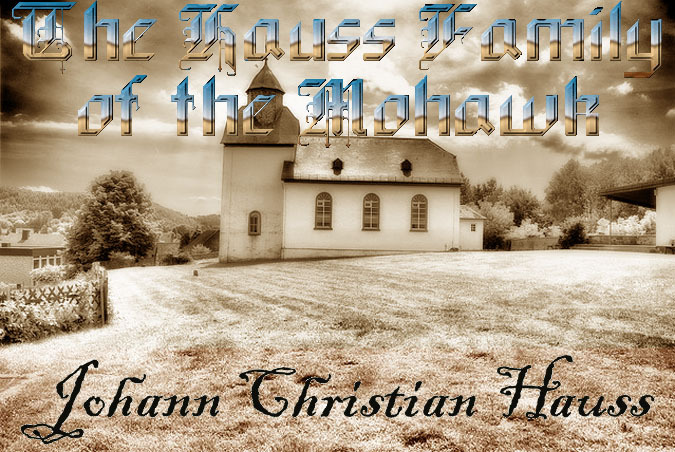 Joshua Kocherthal was one Christian Hauss, widower, a carpenter of Alten-Staden, near Wetzlar in the ducy (sic) of Solms..."
Our "House Family of the Mohawk" was originally the Hauß family of the Lahnliving in a village called Großaltenstädten, by the Lahn River, near the Imperial Free city of Wetzlar, 15 kilometers west of Gießen in what is now Hessen (or Hesse), during the 1500's. At that time, Großaltenstädten was in the Herzogtum (also called a duchythe official territory of a duke) of Solms. The Imperial Counts of Solms, called the Grafen von Solms, were descended from King Charlemagne. Their influence grew over the centuries, and in the late 1600s, they became cousins to Queen Mary of England (as detailed here). A map of the area where the Hauß family is first recorded (for a larger version, click on the image). You can view more maps of the area from the University of Marburg Archives, which charts the war-torn area from 1567 to the 1800s. Klein Altensdädten, 15 kilometers west of Gießen, is where the family was registered in the 1500's and 1600's. But there are still many Hauß families there today. 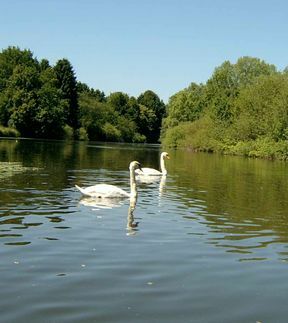 The Lahn between Gießen and Wetzlar. The family seat is said (by some) to have been located initially in Oberndorf, but the Burgsolmsan ancient castle located in the river itselfseems more likely. (Sadly, the last remains of this castle were demolished between 1952 and 1954.) The family appears to have possessed several estates in the region long before 1129, when the first recorded Lord of Solms appears as a witness in a document in which Clementia Grafin von Gleiberg founded the convent of Schiffenberg. That document contains the oldest known members of the Solms line: MARQUARD I, first recorded Edelherr (Lord) von Solms (’de Sulmese’), fl. 1129-1141; and HEINRICH (’Henricus de Sulmese’) probably his brother, possibly a son, then appears in 1156 as a monk at the monastry Ilbenstadt. Heinrich I, Graf von Solms (possibly their son) then appears in a document dated 1212. Hartung von Solms (possibly Heinrich’s brother) also appears in documents dated 1161-1213. In 1226, the brothers were officially referred to as the "Solms." Around 1250, the Grafschaft (county) of Solms was divided into the territories of Solms-Königsberg, Solms Burgsolms and Solms-Braunfels. (In 1324, another line called Solms-Ottenstein (Westfalen), appeared, but they died out in 1424.) These lines fought continually for control of the "high road" that led from Frankfurt to Cologne to Wetzlar and Solms. Other targets were the imperial monastery of Altenberg (near Wetzlar), and the imperial city of Wetzlar itself, which saw a lot of battles in the 14th Century. Electores septem sacri imperii spirituales - Imperator gloriosus - Sexta etas mu(n)di seculares - Schedel H., 1493. 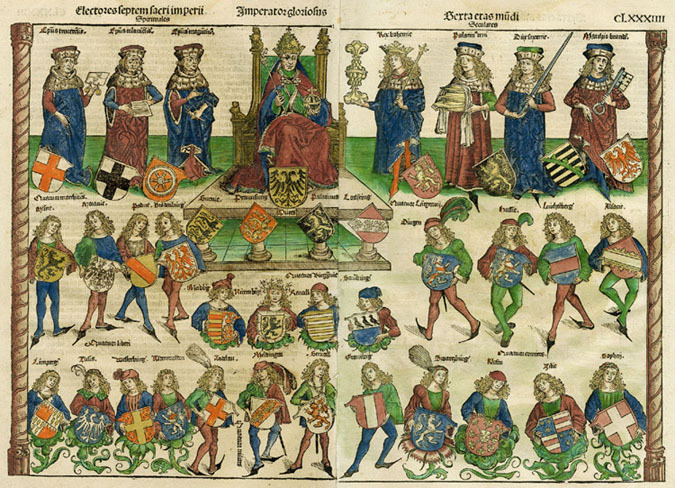 This woodcut shows the emperor and electors of the Holy Roman Empire with twenty four German noblemen presenting their coats of arms. The various domains of Solms were minor states in the Holy Roman Empire (official name: sacrum romanum imperium), a political entity that covered a large portion of Europe, centered on Germania, from 962 to 1806. It originated in the eastern half of Charlemagne's empire, and divided after his death. The HRE was eventually composed of around 360 distinct entities, differing widely in size, rank and power. Some were controlled by kings and princes, and others by counts. Some of these rulers were clerics, while others were secular, but it wasn't easy living under any of them.  1129: First documented member was the Marquard of Solms. 1160: Solms Castle is established as family's residence. 1226: The Count of Solms becomes an official title. 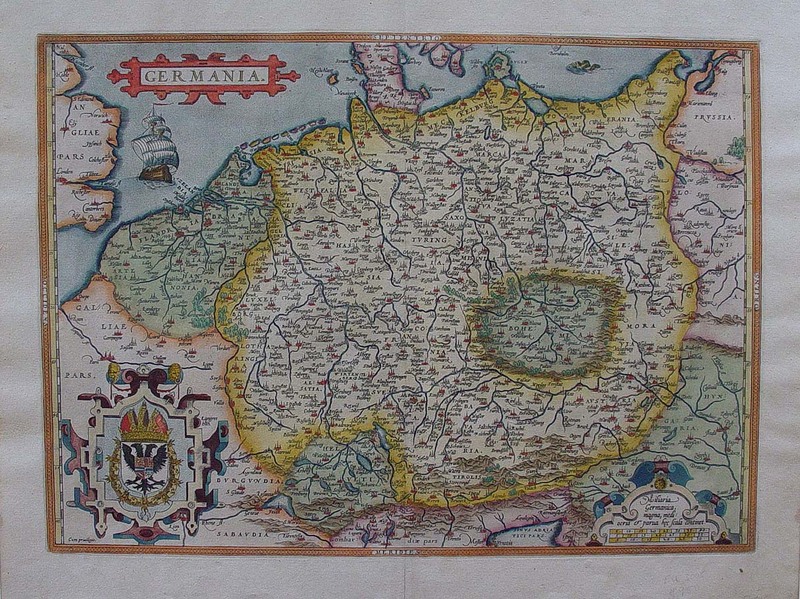 1250: Division of Solms-Königsberg, Solms-Burgsolms and Solms-Braunfels. 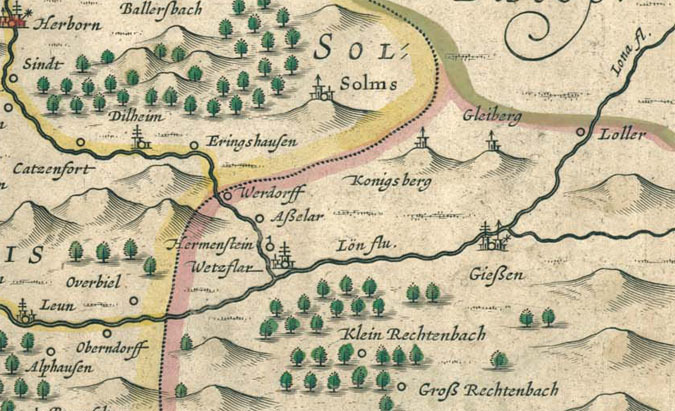 1363: Solms-Königsberg line becomes extinct; the properties are acquired by Hessen. 1375-1378: Johann IV of Solms-Burgsolms becomes the the Lord of Wetzlar. 1415: Solms-Burgsolms line becomes extinct; acquired by Solms-Braunfels. 1418: Solms-Braunfels receives, with the death of last Count of Falkenstein, Munzenberg, Lich, Wolfersheim, Sodeler, Hungen, Laubach, and Butzbach. 1548: Solms-Lich is divided into Solms-Lich, Solms-Hohensolms, and Solms-Laubach. 1602: Solms-Braunfels divided into Solms, Solms-Hungen and Solms-Braunfels. 1678: Divided territories of Solms-Braunfels are reunited. 1742: Solms-Braunfels elevated to Imperial Prince. 1806: Solms-Braunfels splits into Nassau and Hesse-Darmstadt; Rödelheim-Assenheim and Solms-Laubach fall to Hessen-Darmstadt; Solms-Hohensolms-Lich mediatised to Austria, Hesse-Darmstadt, Prussia and Württemberg. 1815: Solms-Braunfels folds into Prussia. The fighting continued in the early 1300's, as Solms-Königsberg allied with the Landgrave of Hessen, strongest power of central western Germany, while the lines of Solms-Burgsolms and Solms-Braunfels remained in opposition. In 1349, their feuding ended in the destruction of the castle Hohensolms in Königsberg, which was then rebuilt close to 1351. Then in 1363, Count Philipp von Solms-Königsberg, who by this point had actually sold his castle and office to Hessen, died without heirs, ending that line of the family, and temporarily ending all of the feuding... At least until 1376, when Count John IV of Solms Burgsolms took advantage of the unrest in Wetzlar and seized the castle. But in 1384 the castle was destroyed after battling with Wetzlar. 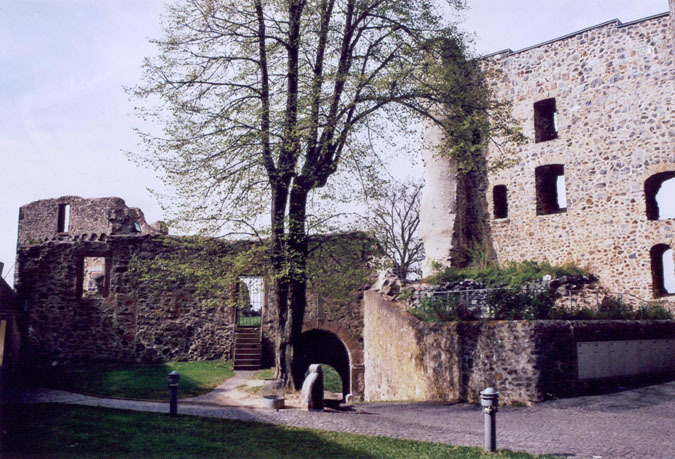 Count John IV then moved his seat to the castle Greifenstein, and never regained his former power. The Burgsolms Solms line ended with John VI in 1415, and Solms-Braunfels was the only remaining line, with castle Braunfels to the new family seat. 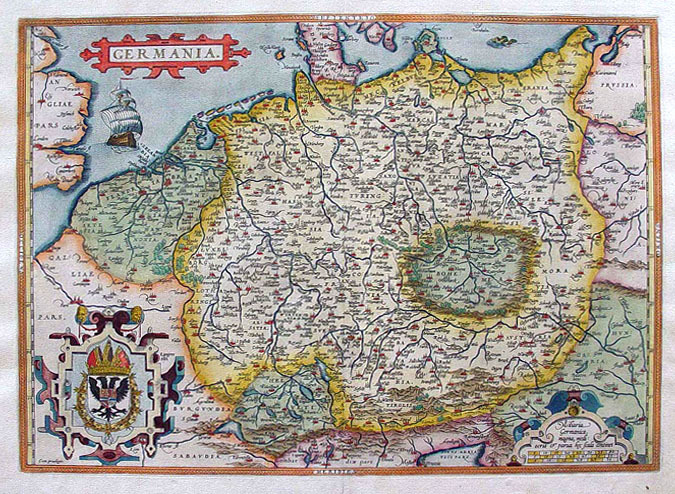 Germania in 1595, in a map by Abraham Ortelius. Printed in Antwerp. Click to enlarge. 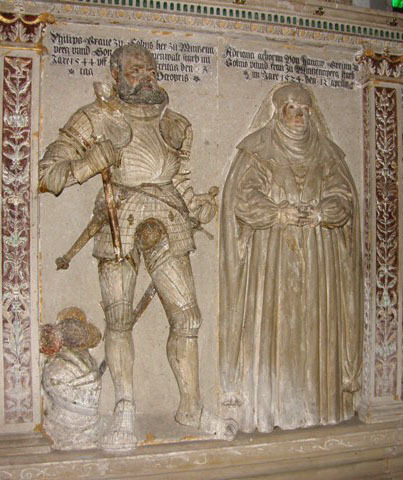 The cenotaph of (Graf) Philipp zu Solms-Lich (1468-1544) and either his wife, Adriana, or his mistress, Walpurga Lindenlaub, in Marienstiftskirche, Lich. Count Johann's descendant, Philipp von Solms-Lich (pictured at right), expanded the castle Hohensolms into a residential palace. He also appeared at the Imperial Court of Emperor Maximilian I (1493-1519) as well as Emperor Charles V (1519-1556) and was awarded the rank of Imperial Council, despite supporting Martin Luther in 1520/1521. When he died in 1544, he was in in control of all the castles and lordships of Johannine line. Upon his death (when he received last rites from both the Catholic and the Lutheran faithafter the Reformation, he wasn't taking any chances), his counties were splitwith Hohensolms and Lich going to the eldest son, Count Reinhard I. * Solms-Hohensolms (1548), which became Solms-Hohensolms-Lich in 1712, and reichsfürstlich (royal) in 1792. "As governments are made and moved by men, so by them they are ruined too. Wherefore governments rather depend upon men than men upon governments. Let men be good, and the government cannot be bad. If it be ill, they will cure it. But if men be bad, let the government be ever so good, they will endeavor to warp and spoil it to their turn." Castle Jugendburg in Hohensolms: Burgstraße 14, 35644 Hohenahr-Hohensolms. Telephone: 06446/92310. Traces of the Hauß family in Solms at that time are very scarce: In researching the vital records of the churches at Aßlar and Königsberg, and the nearby parishes of Erda and Hohensolms, there is barely any record at all of a family by the name of "Hauß." One of the few appeared during the 16th Century: When a Peter Hauß of "Altenstädten" was registered at offices in Königsberg (in Eastern Prussia) and at Hohensolms (a castle in Lahn-Dill-Bergland, Hessen, 18 km from Wetzlar, pictured above). Admittedly, that doesn't tell us much. In fact, there were actually two villages called Altenstädten in Solms, the first named Kleinaltenstädten, and the second Großaltenstädten (Klein = little; Groß = big). Kleinaltenstädten is situated about two miles northwest of Wetzlar, and Großaltenstädten was about 7 miles north. Neither village had its own parish, so the people from Kleinaltenstädten would report to the church in Aßlar; and the people from Großaltenstädten went to the church of Königsberg. By registering in Königsberg, we know the Peter Hauß family would have probably lived in Großaltenstädten.³ He registered there several times, in the years 1558, 1559, and 1565, according to lists of Shrove Tuesday hens, garden taxes, and subject money now held at the state archives of Marburg (110 Acc. 1939/31, No. 167). 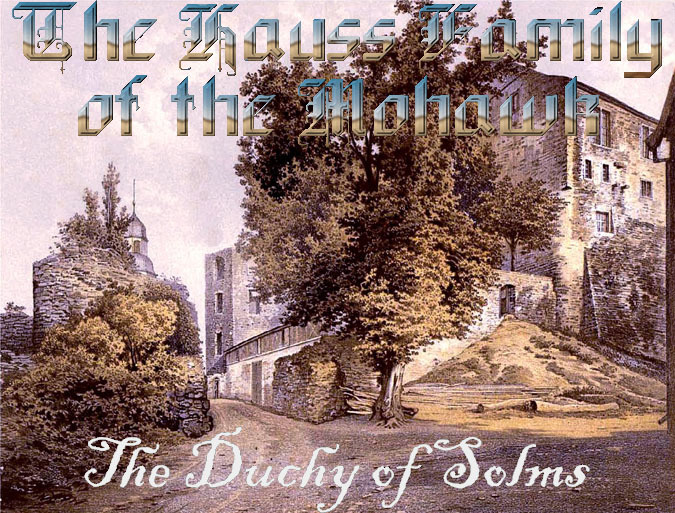 The first Count of Solms-Hohensolms was Hermann Adolf (28 Sep 1545 - 19 Jan 1613), son of Reinhard I, Graf zu Solms-Lich Hohensolms (b. 12 Oct 1491) and Maria von Sayn (b. 04 Apr 1506). Hermann's rule began in 1562, and Peter Hauß of "Altenstädten" registered at Hohensolms castle in 1565 (previously the domain would have been Solms-Lich). Burg (Castle) Hohensolms, where the Hauß family of Großaltenstädten registered, as it looks today. The population in the area was split into two groups, labeled either Leibeigene ("serfs") or Leibfreie ("free subjects") with more rights than serfs, but still bound to their local ruler. Essentially, the best a man could hope for was that, through hard work and penance, he could eventually rise out of serfdom to earn the privilege of citizenship, which was called Bürgerrecht. With this, a man could gain property and possessions, which could in turn provide wealth and power, strengthen his family through political influence, and give him a say in property disputes. Bürgerrecht wasn't freedom, but at least it gave a man a voice in determining his fate. In order to attain Bürgerrecht, a serf had to register as a taxpayer and provide church penance (as Peter Hauß was doing in those tax lists). There was no separation of church and stateso you had to worship under whatever faith your ruler commanded, and paid that church. The official state religion could change as often as the rulersand in feudal Germany, they changed a lot! Between disasters, the Hauß surname appeared sporadically in the few church texts that weren't burned or trashed: About fifty miles south of Großaltenstädten, in Geinsheim, a Hans Hauß was Schultheiß (alderman) in 1522, 1530, 1531, 1540, and 1543. (Members of the Hauß clan were aldermen there from the 16th through the first half of the 18th century.) Another Hanns Hauß was recorded on the tax rolls in Nieder-Weisel, Solms-Lich, near the village of Hausen in 1643, where his family operated a tavern called The Stag and The Swan. Elsewhere, a "Johann Hauss" was one of 125 signees on a list of donors in the church books of Altenstädt of Marsberg, marking the purchase of an organ for the village church in 1653. A silver gulden (60 kreuzer) from Solms-Hohensolms, featuring Count Ludwig, struck 1676-77. 1666 - 1725. Johann Christian Hauß is born into a poverty-ridden, war-torn, plague-inflicted wasteland... and aren't we lucky for it! TOP PHOTO: The southeastern side of Hohensolms Castle, where the Hauß family paid their taxes in the 16th Century. Print by Alexander Duncan (1813-1897). ¹On May 10, 1679, Castle Braunfels burned down, and almost all of the records pertaining to the oldest Solms'chen seats of Burgsolms, Braunfels, and Hohensolms were destroyed in the flames. * Solms-Greifenstein (since 1693) and Solms-Braunfels, reichsfürstlich (royal) since 1742. ³The town of Großaltenstädten was first documented in the year 1241; and a small chapel was mentioned in 1310. It is situated in Lahn-Dill-Kreis, Giesharpen, Hessen, Germany, about 60 kilometers north of Frankfurt/Main. (Latitude 50.6667; Longitude 8.5000; Altitude 1125 feet; Lat [DMS] 50° 40' 0N; Long [DMS] 8° 30' 0E; Altitude 342 meters; Time zone estimated UTC+1[+2DT]; Google Map) The closest airport is ZNF - Hanau Aaf, located 64.3 km south east of Großaltenstädten. More nearby airports include FRA - Frankfurt Main 71.3 km south, ZNV - Koblenz Winningen 78.7 km south west, CGN - Cologne Koln Bonn 98.3 km west, ZCA - Arnsberg Menden 100.1 km north west. In the state archives of Marburg there is evidence that at the end of the 1500's, several families by the name of Hauss were living in "Altensteden." 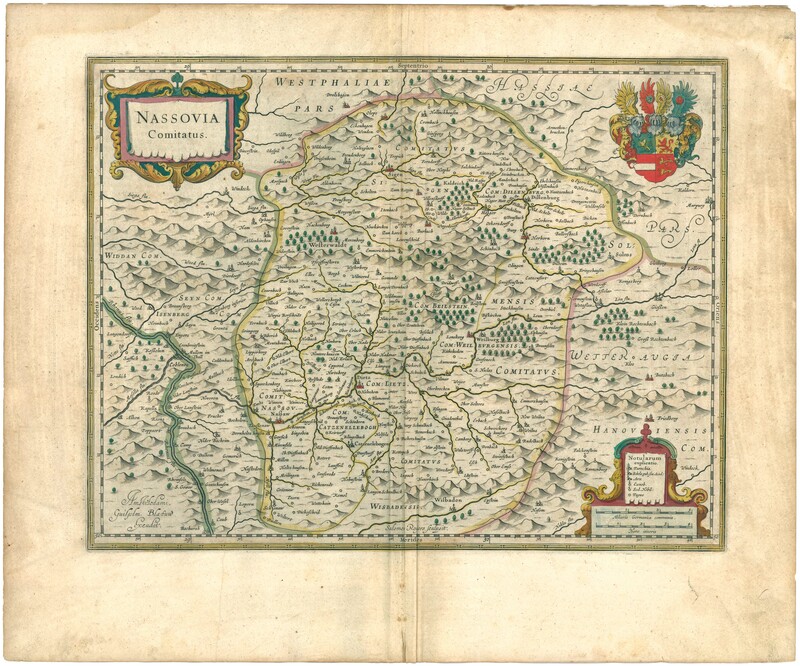 The New York records of our immigrant ancestor mention "Alten-Staeden, near Wetzler, duchy of Solm," which led to the assumption in The Palatine Families of New York that Johann came from Klein Altenstädten, because it was closer to Wetzlar. But the Hauss family are not found in the vital records for that village (they would have been registered at the Church at Aßlar, if that was the case, not at Königsberg). So the village that Johann was referring to would probably have been Großaltenstädten (according to German genealogist Uwe Porten in 2007). The Duchy of Solms was dissolved in 1806. After a short while being part of the Duchy of Nassau, it passed to Prussia in 1815. Hohenahr: Burg Hohensolms, Burg Alt-Hohensolms, Erda, Altenberg, Groà ¡ltenstå¥´en, Altenkirchen, Mudersbach, Ahrdt; Publisher: Books LLC; Language: German # ISBN-10: 1159058423 # ISBN-13: 978-1159058425. 34 pages.